If we get our way, you’ll get a little more time to get where you’re going on that Muni transfer. We’re working with the budget process (in the face of yes, a cash fare hike) to make life a little better for riders. Specifically, we’re working to increase your transfer time from an hour and a half to a whole two hours. We all know Muni takes too long to get from one place to another. And two hours is standard so many other places. We don’t anticipate this change will impact the budget in a significant way, and if Muni’s going to raise fares, they need to make service a little fairer. While cash fares are going up — when don’t they? — noncash fares (Clipper, MuniMobile) will actually hold steady. And the kicker: a Day Pass is being proposed for just 2 times the fare, so $5.00 (excluding cable car rides). This is huge. Current day passes are targeted towards tourists, include the cable car, and cost an eye-popping $22. To ride all day at $5.00 makes Muni actually cost-competitive with private transportation for getting your errands done and getting out on the town. 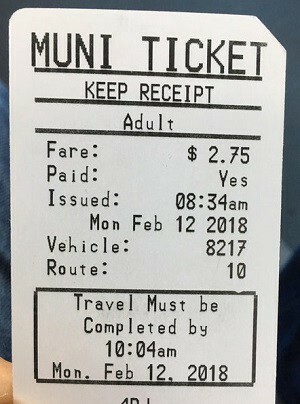 The fine print (of course): the day pass will only be available on MuniMobile. It’s too much to roll into Clipper now, but will be available when Clipper 2 happens. At that point, it should include an accumulator function: if you tap your card for two rides in a day, any subsequent rides that day are free. Also, if you do MuniMobile, the day pass that includes the cable cars is set to be cut almost in half, down to $12 for the next couple years. In other budget news: the ridiculously overcrowded commute on the N-Judah might get some relief. Muni plans to get trains coming every 4 minutes, up from 7. (Wait, trains run only every 7 minutes during rush hour? No wonder the N is a can of sardines!) To balance the cost, Muni’s going to try single cars (at the current frequency) on the weekends. They promise to increase service for special events, and we’ll keep an eye on it to see if it works. We’re not excited about any service cut, but the bottom line is budgets always have compromises. And that N-Judah commute needs some serious help. The budget also calls for hiring more full-time maintenance employees. Yes. These are the jobs of the future, and maintenance is a big part of keeping service reliable. What we’re least happy with in the budget is Muni’s plan to hold service steady, and to find “efficiencies,” which can be code for service cuts. We need to be expanding service as our population grows and our traffic congestion worsens. And currently, service in many areas is inadequate and not meeting its promised performance. Neighborhood routes like the 27, 23, 67, and 54 are very poorly served, with lots of ghost buses and just plain non-existent buses causing unacceptable waiting times. While it’s looking for “efficiencies,” Muni needs to re-dedicate to minimum levels of service on all lines. Read our full letter to the SFMTA Board here. Want us to keep an eye on such thrilling things as the SFTMA budget for you and all riders? Please support our work.